This week we reviewed poetry as it is one of the reading selections every year on the Grade 3 test. I thought I would share with you some of the resources and activities we did this week. 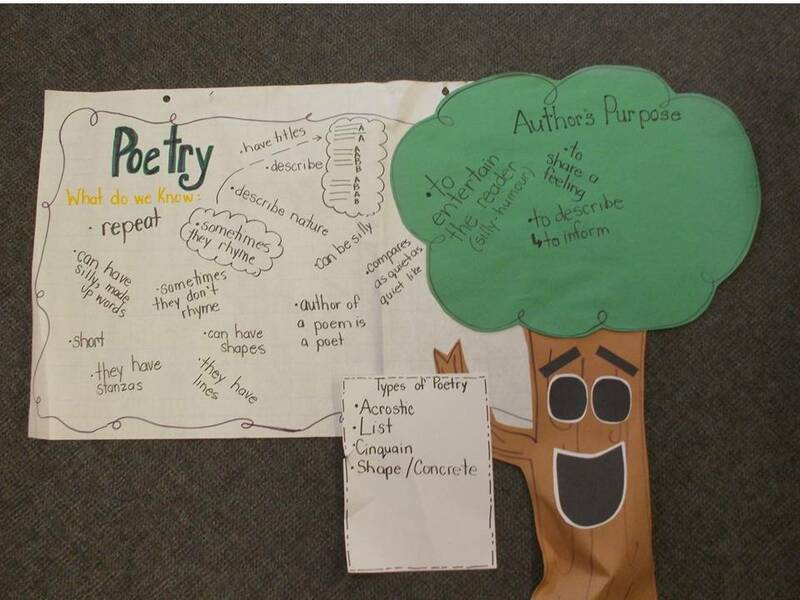 We reviewed what we know about poetry. This is the anchor chart we used last year in grade 2/3. This year I made posters for our bulletin board. Our focus in preparing for the test is really on the features of the poem. 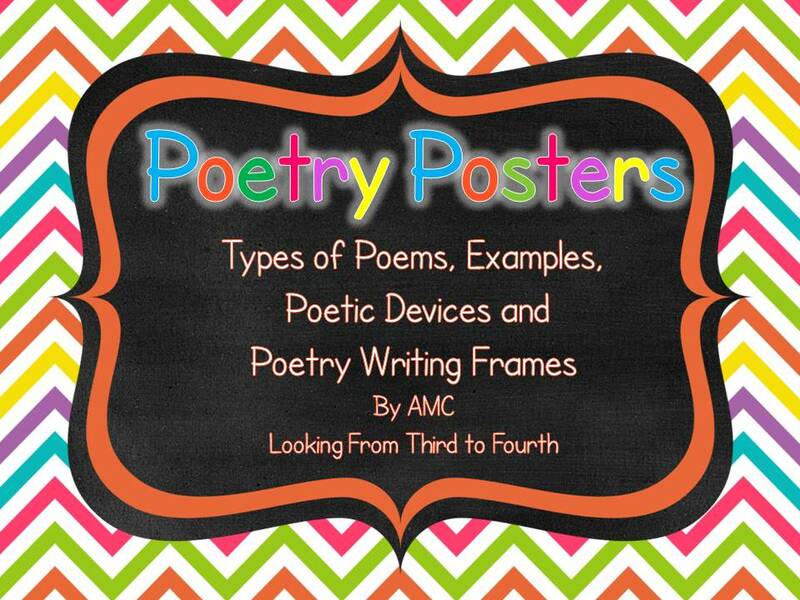 You can pick up a copy of my poetry posters in my TpT store now. Then we read the poem "Boa Constrictor" by Shel Silverstein and looked at its features. One of the features is the use of interjections to show emotion. Then we watched this video. Which led us to learning about onomatopoeias. So of course we watched this video. Then we completed the onomatopoeia page from Collaboration Cuties booklet on Figurative Language. You can read their post about this booklet here or click to head over to their TpT store to pick up your free copy. Then next day we moved on to idioms. We read all about them in these books. Then we completed the idiom page from the Figurative Language Book. 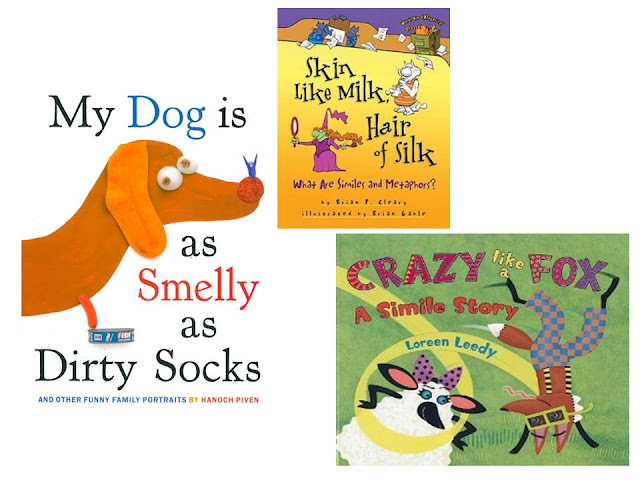 Then we learned about similies and metaphors using these books. We completed the simile page. We also created onomatopoeia word art and wrote a little rhyming poem to go with it. I used the Superhero clipart from Melonheadz to go with their poems and word art. 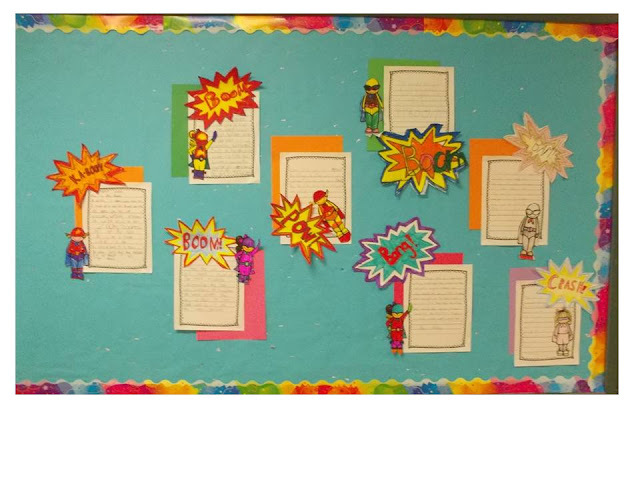 Our spirit day next week is Superhero day so our bulletin board in the hallway is ready. 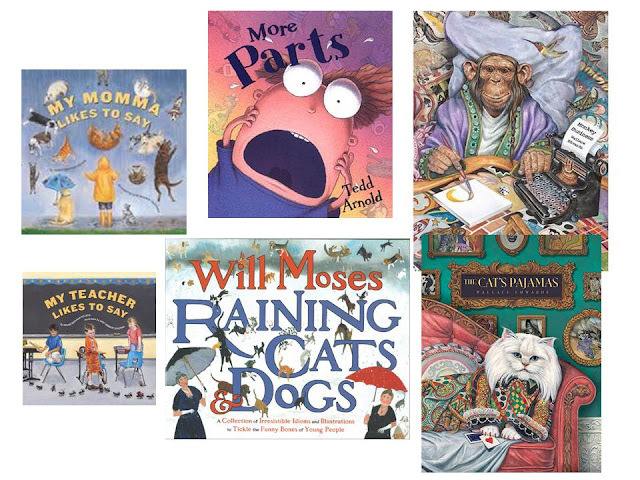 I heard about a lot of these books through the Mentor Text Linky hosted by the lovely ladies at Collaboration Cuties - be sure to head over there today to get more book suggestions. Click on the button below to go there now!!! What a wonderful unit of study. My kids love learning about idioms...whenever I say one know someone always whispers "idiom" when they hear it. It is too fun. Wow! That was a LOT packed into one week, and one post!!! Like Brandee said, lots of pinning to do!!! Thanks for sharing all of these wonderful things!! Your resources are so colorful and eye-catching! Great work! I especially like those poetry posters. You really did a nice job! Thanks for the great post and awesome ideas! 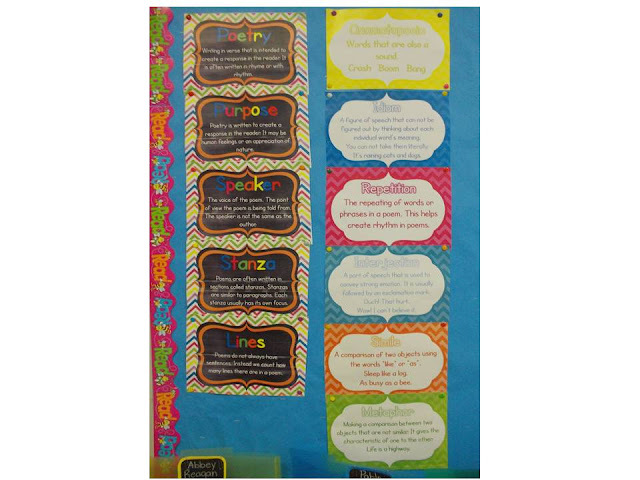 I love your poetry posters and super hero bulletin board...so colorful! 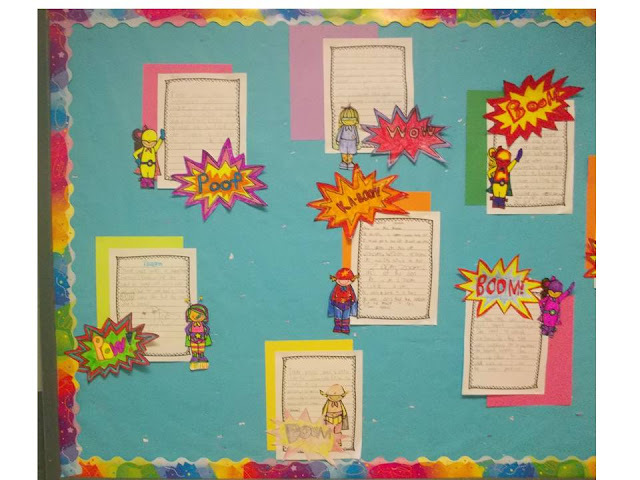 I love the word art super hero projects! The youtube videos are great too and I added those to my favorite to refer to next year (or this year if I want to give the students a fun review!). Thanks so much for sharing!